We meet either at Dornbirn train station or at the Gütle Restauran (it would be helpful if we had cars at the Gütle for the return trip because the buses are running not very late). From there we go by bus 47 to the station „Alploch Schmitte“. From there we walk on foot through the Alplochschlucht and Rappenlochschlucht to the Gütle. It is a very nice and easy one hour walk and we can enjoy a cool drink at the Gütle. A smaller group than usually biked to Hard, where they were met by a couple more people. We started our walk at the icecream parlour, and made sure we had the necessary calories to manage the walk to the Rheindamm. There Eva and Kurt filled us in about the history and natural peculiarities of the Rhine as it flows into Lake Constance. 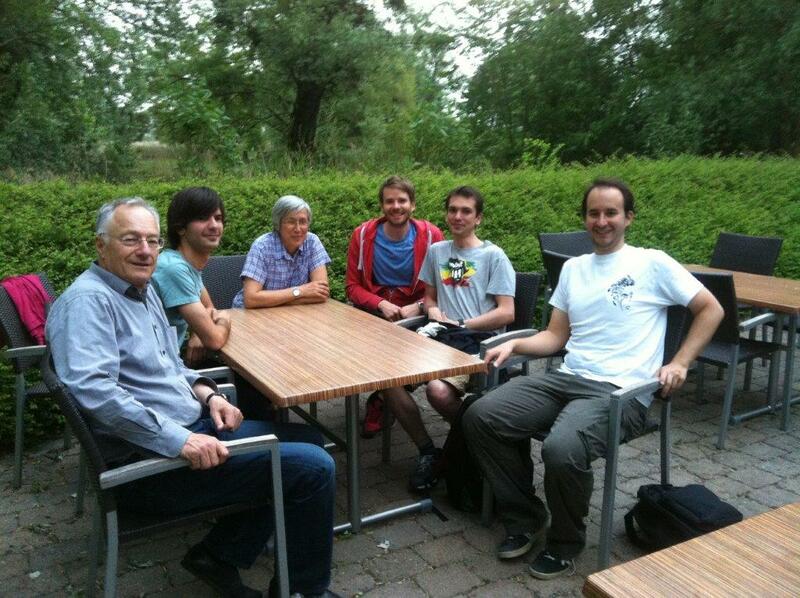 We finshed the outing with a beer at the Fischerheim Schleienloch and only left because it started to rain. Eva was invited to present GlobalVorarlberg at the PechaKucha night in Dornbirn in February. In less than 7 minutes she explains who we are, what we do and what we would like to achieve. Take a look. http://www.youtube.com/watch?v=RX7MIf04vx8&list=UUg83qSo29r6BBtSWwEEK0Kg It’s in German though. On January 23rd, we had a wonderful tour of the vorarlberg museum in Bregenz this time. Our guide was the deputy director of the museum and he told us lots of little anecdotes that you could not hear otherwise. We finished by trying the excellent wine they serve in the café there. 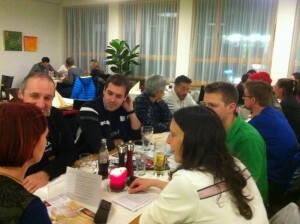 On February 20 th we met in the Bierlokal in Dornbirn. 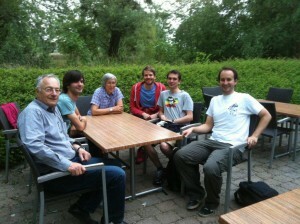 Once again it was a successful gathering with 14 people present, all ages and at least 5 different nationalities. After a round in which everybody had a chance to introduce themselves, nobody was short of conversation topics and we all had fun. October 22 and November 26 — Our game nights don’t seem to be as popular as the hikes. Which is a real pity, because we had some fun games. And we played them in English and German, whichever language came first to your mind. Quite refreshing and brought about some laughter due to the funny situations that stemed from our unothodox use of language. In case you were wondering what we played. After lookting though the options we decided on „In a Pickle“, a word and reasoning game where you had to find things that fit into another or were larger than the thing in question. You had to be rather creative to convince the others of your choice. So, in case you were wondering, there was no money involved… just plain fun card games this time. Next time we’ll try the Dreidel.